No, I will not shut up about moving yet, because I am absolutely floored by how much this move took/is taking out of me. First, a little bit about my beloved boyfriend and I. To put it plainly, he is the frog of the relationship, and I am the toad. Toad: But, what about this potentially awful thing that might happen? What if it’s not even worth it to move? Frog: That will not happen. Our new apartment will be sweet, the moving process will be free of complication and fairly cheap. And, because I am a Toad who also works very hard to be more flexible and optimistic in her major relationship, I believed him. When the move became more and more complicated, expensive, and difficult, my Frog was worn down. On Official Moving Day, I had to take the god forsaken 39 bus through standstill traffic all the way into school to work for a few hours. I hightailed it home quickly afterward, only to be kicked off my train and left to walk in the 95 degree heat, with sleep deprivation behind me and the prospect of unpacking all of my crap into a shared apartment space ahead. This move was enough to break even the Froggiest of Frogs. Whenever I talk about moving to Boston, the phrase “the worst day of my life” comes out of my mouth without any hesitation. A year ago, I let my Frog talk me into leaving Michigan at 2 in the morning instead of waiting until daylight hours. We made it to the first rest stop on the Ohio Turnpike before said Frog started falling asleep at the wheel. We dozed together for a few hours in the front of a very small pickup truck, and I woke up repeatedly with my heart throbbing in my chest, dreaming that someone in the rest stop parking lot was stealing all of our earthly belongings from behind us. After another nap, a little rain, tolls, hills, hundreds of miles traveled at 55 mph, and Red Sox traffic, we met our realtor in Boston and proceeded to move all of our belongings up three flights of stairs. It was after midnight when we finished. However, when we woke up the next day, life hadn’t quite started. Getting there was the hardest part. This time around, life didn’t stand still for a few weeks while we got our bearings. Lance returned to school the next morning, picking up his first week of teaching where he left it. I reported for work at Job #1 at 9 a.m., and clocked out of Job #2 at 9 p.m., and classes started the next day. Truth: I didn’t even have time to take a shower. My brain did not enjoy this. My mental fog didn’t clear until about 2 p.m. on Thursday. My body liked it even less. Excedrin. Sore muscles. Stress stomach. It was like everything in my life vanished on Wednesday. It’s coming back slowly, in pieces, but unfortunately, grad school waits for no woman. Papers. Readings. Articles. Oh, my! 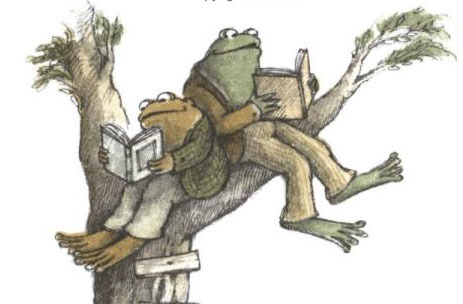 I love the Frog and Toad analogy. I love those two so much!